I am so ready for my internship to be over, so I can get a real paid position somewhere, and I am absolutely giddy over the fact that my wedding now is only a little over 8 months away. Yes I know that seems like a long time, but with everything left that we still need to do, I know it will go by fast. I CAN'T WAIT! I am definitely ready to be married and to say that Morgan is my husband. Somewhat a weird feeling, since I am basically the first one out of all of my friends and the first one in my family to get married, but absolutely the best feeling in the world to have someone that loves me so much that I can honestly say that we are going to grow old together, side-by-side. What an adventure our lives will be, together. 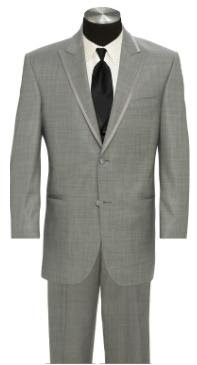 I came up with this as a possibility for the groomsmen. 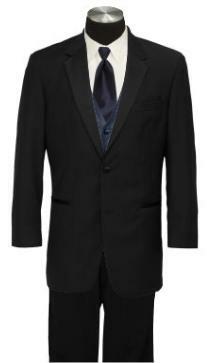 Black Kalvin Klein jacket with marine blue (same color as the bridesmaids dresses) vest and tie. I think it looks really nice, but we will work on it when we get to go in person. Option number two...my favorite! I really like the grey ensemble, it is very classy and unique. Everyone would look super handsome in something like this. Me too!! But I really want to go in person and see what Morgan likes. I really want him to be a part of everything, if he wants to.